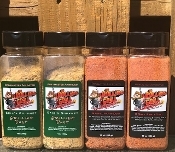 RGrill Party Dust is an All Purpose Seasoning that elevates the taste of whatever your cooking. Excellent as a Blackening, BBQ Seasoning or anything your cooking. The Best of Both Worlds consist of (2) Grilling Dust and (2) Rgrill Party Dust! These savory blends of spices will add intense flavor to whatever you cook. Sprinkle on Steaks, Burgers, Beef, Chicken, Pork, Seafood and Vegetables. Three The hard Way consist of (3) Grilling Dust and (3) Rgrill Party Dust! These savory blends of spices will add intense flavor to whatever you cook. Sprinkle on Steaks, Burgers, Beef, Chicken, Pork, Seafood and Vegetables.